Ken Dernbach is the Service Desk Manager at LPL Financial, ITIL v3 Foundation certified, a Novell CNE, a Microsoft MCP, and has over 20 years of IT industry experience with over 15 years managing service delivery teams. Ken holds a BA in Business Administration from National University and an MBA from the University of Redlands. Jason Rosenfeld is the IT Service Management Practice Lead at Cask, LLC, an ITIL v3 Expert, Lean Six Sigma Black Belt and has 15 years of hand-on ITSM and Service Delivery experience. He is the President of the ITSMF USA San Diego LIG and is currently working with Carnegie-Mellon-University and industry leaders on the Cloud Service Measurement Initiative Consortium. Jason holds a BS in Industrial Engineering from Lehigh University. Today’s workforce expects a world class and customer centric onboarding experience but often, this is not the case. Manual processes, multiple systems and limited visibility get in the way which cause long-lasting employee frustrations for all involved in the process. Cask with the power of the ServiceNow platform provides transformation solutions tailored to our client’s needs. Get an inside look at how we helped one of our clients transform their onboarding experience and reduce their onboarding time by 80%. Join Cask if you're having trouble protecting your data? We get it. It's a complex job for compliance teams that are required to comply with specific regulations and standards such as GLBA, HIPAA, PCI-DSS, SOX, NIST, ISO, SOC 1/2/3, etc. • Decrease repetitive compliance activities for employees by leveraging a set of common controls across NIST, SOX, HIPAA, PCI-DSS and other standards. There is a great amount of focus (rightly so) that goes into managing contact centers. Driving down the cost per contact is one of the primary objectives of a support organization, and our associates at Cask work closely with our clients to maximize efficiency while maintaining exceptional levels of customer service. Working with the ServiceNow platform, contact center costs can be decreased substantially by enabling a world-class self-service support channel. Our expertise at Cask helps to maximize the potential of self-service by designing the support portal and fortifying it with a top-notch knowledge management process, ensuring that your customers have easy access to relevant and timely information when they need it. Becton Dickinson was in a position where their consumers had no automated mechanism to seek guidance or submit requests for a specific set of services that a division offered. 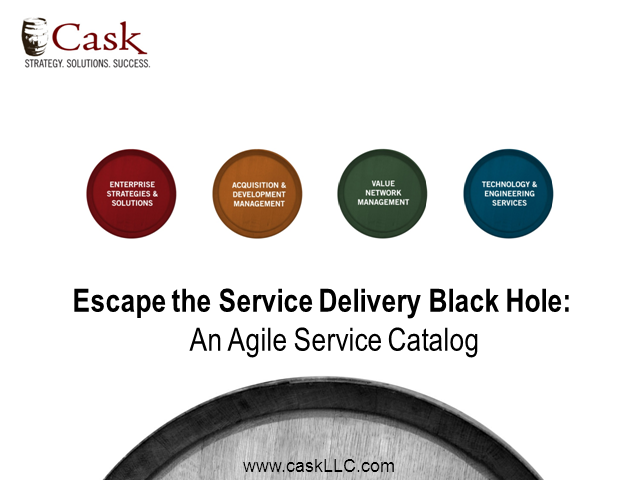 Cask used our capabilities in portal design, knowledge management, and case workflow design to enable consumers to skip the need to email or call a contact center to submit these orders manually. The result was a significant increase in BD’s abilities to fulfill orders, while at the same time decreasing the number of customer contacts via email and phone calls. With over 15 years of operational and consulting experience, Mark works closely with clients to enhance their support organization's capabilities to provide world class customer service in an efficient and empowering way. Matt is a global IT leader who's worked various roles within this space over the past 17 years. He has worked in both consulting and industry positions and has focused primarily on the ServiceNow platform and strategic process improvement over the past several years. Identify hotspots in your organization where complicated, antiquated or unconnected processes are holding you back. Are you ready to make onboarding a lot faster, easier and more effective? Enterprise Asset Management Success Stories with Cask and Stave. Join Cask. There’s a lot to be said for standing up a basic ServiceNow HR Case Management implementation. However, “good, fast and cheap” are really difficult to achieve at the same time. Focus on ensuring you get a “good” implementation partner that works with your team and aligns to your HR strategy. Join Cask for an informative webinar exploring strategies for leveraging the data you already have in your ITSM system. Join Cask for an interactive conversation and demonstration as our team at Cask highlights the multiple and meaningful avenues of support that your organization can provide to your customers. Don’t miss this incredible opportunity from Cask to find out key ways to drive successful transformation of ServiceNow in your organization. Are you struggling to drive adoption of the platform? Do you need to increase automation, self service and business results? Stephanie Otto and Jason Rosenfeld will analyze the key drivers of digital transformation to set you up for success. You will walk away with actionable elements and methodologies to apply design thinking to create solutions that resonate with your audience and best practices on how to ensure rapid adoption. We will demonstrate real world examples of how this has been done effectively and help guide your journey to increase your return on investment and build brand equity. With the passage of the Federal IT Acquisition Reform Act (FITARA), agencies are looking for ways to improve IT financial accountability and performance. Cask and Apptio invite you to a live webinar, Financial Management in a FITARA World, where you will learn how to promote transparency in existing IT assets to enable better IT planning and budgeting. The fall semester has started at universities across the country, and many schools are beginning to look out into 2016...With over 150 universities across the globe downloading our white paper, Services University: Transform Higher Education IT Organizations with a Services Focus, we thought it made a ton of sense to talk to some of our customers about these topics and share this conversation with you! How are Higher Ed IT Departments different from IT departments in other industries? How are they similar? What is the most important step in becoming a services-focused organization? What is the biggest challenge in transforming an organization to a services focused one? What initiatives are you focusing on for 2016? Watch on demand now and bring your questions to learn how a shift to a services focus can help your organization. In this session, we will continue our detailed investigation of the ITIL® framework, as we take on Transition Planning and Support. It’s one of the most recognized processes from the Service Transition book. Service Transition is a seriously undervalued part of the IT services lifecycle, as it stands between design/development and “Business as Usual” (BAU) operations. While there is consensus that this is an important part of the equation, there is frighteningly little consensus about what good operating practices look like. In many cases, people on both sides of the Dev/Ops gulf struggle with where responsibilities start/stop and how to mediate the differences. In this session, we’ll dig down into the guidance to understand the transition stage and its fit within the lifecycle. As we do, we’ll talk about some practical steps you can take to reduce the associated uncertainty with and increase the number of successful transitions. What you should pay attention to, to ensure you are getting all you can from your Service Transition activities. Register now - join us to find out how to have Transition Planning and Support deliver better results for your organization. What you should pay attention to, to ensure you are getting all you can from your IT Service Continuity Management activities. Register now - gain a fresh perspective on how IT Service Continuity Management can help your organization. In this session, we will begin our detailed investigation of the ITIL framework with Demand Management. It's one of the lesser known and talked about processes from the Service Strategy book. While some would consider Demand Management useful only to those who wish to amaze and confuse their peers at ITSM conferences, these same people would be surprised. An understanding and appreciation of Demand Management is an absolutely critical input to several practice areas which most consider "core" to ITSM. Register now - learn how Demand Management can help your organization. Where do you want to be someday? Join Cask's Jason Rosenfeld, and featured guest, Eveline Oehrlich of Forrester Research in our upcoming webinar where we will describe the key journey of shifting your technology management strategy from running the business to changing the business – no matter which acronym you want to use. The "secret" to Service Management success varies across organizations, as every business has a different set of people, processes, tools, and systems. At Cask, we recognize that every organization is unique, and we tailor our Service Management solutions to fit the needs of our customers. We have worked with clients across all industries and sizes, and at varying levels of maturity, to enable the Service Management transformation that is right for their organization. Register now - learn what Service Management "secret" can help your organization. Running a global IT organization today is no easy feat. Many of these organizations are spread across multiple countries, support thousands of people, and deliver services to millions of external customers. All the while, these IT organizations must find ways to of deliver better and faster service, while keeping costs low, and still be recognized as a source of innovation for the business. Finding your true love is not easy. For some people it takes over half of a lifetime to do. For others, they may believe they have found their true love, only to spend all of their time and energy constantly trying to change that person. Similarly, many organizations select ITSM tools, only to spend years changing and modifying them until the tool becomes unrecognizable and no longer supports the organization. This leaves them in desperate need of “tool divorce” as they begin running away from their tool rather than thinking strategically and taking the right steps to find the right tool for their organization. With the number of ITSM tool vendors out there, we know finding the right one can be as difficult. Don’t end up in another painful ITSM “tool divorce.” Join Jason as he goes through some important concepts to select the right ITSM partner and key actions to ensure you end up in IT harmony with the right ITSM tool. Instead of a periodic frenzy of activity to generate material to satisfy your auditors, implementation of these suggestions will help ensure that day-to-day incident, change and related ITIL processes not only support efficient service management, but generate records that validate the effectiveness of governance controls. Cask is a results-oriented business and technology consulting firm that helps organizations change, grow and run their businesses at new levels – previously thought not possible. Our team is a rare blend of experienced business consultants and artisan engineers. This unique combination enables our customers to embrace organizational change, adopt transformational technology solutions and operate their business generating optimal results. We enable transformation through Organizational Change Management and reinforcement.